josetteplank.com: Holiday! Celebrate! Oh yeah! Oh yeah! Holiday! Celebrate! Oh yeah! Oh yeah! My two lovely daughters and very-pregnant I are off on holiday for four fun-filled days! I like saying “holiday” instead of “vacation”. I like calling it a “holiday” because it makes me feel more cosmopolitan. More cultured and worldly. People just assume you’re going somewhere fabulous like the Basque coast or Mykonos, where you’ll romp in the cultured and worldly sun wearing a white crocheted bikini and drinking limoncello. Or, heck, they might even assume you’re going to Brighton to walk the pier and drink shandies, or to Blackpool to ride the donkeys and drink shandies. Say “vacation” around here and people immediately assume the Jersey Shore and jellyfish and vomiting teenagers. Which, actually, doesn’t sound half bad. If they had donkey rides at Wildwood, NJ, I might be half-tempted. As it is, I’m not going anywhere half as exotic as New Jersey. To romantic and picturesque Schuylkill County! 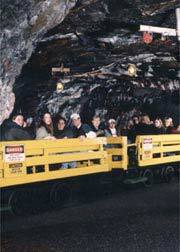 Oh, the allure of the strip mines! We’re holidaying in Schuylkill County at my family’s villa in the mountaintop hamlet of Frackville, where we’ll romp in cut-off jean shorts and bare feet (a.k.a.“hillbilly flip flops“) while sipping Frank’s ginger ale from jelly jars. We’ll relax on the shores of Locust Lake and swim in the clear beauty of its trout-laden waters alongside guys in hip waders and women with “Git R Done” tattoos across the top of their buttocks. We’ll spend long evenings sitting on the front porch eating teaberry ice cream and counting cars - you get a point for every blue car, I get a point for every white car - until the siren goes off at the volunteer fire station, and then we all take bets on how many volunteer fire fighters in pick-up trucks speed by in the following ten minutes on their way to the firehouse. And those who do recognize me will most likely also remember what I looked like in ninth grade. So, even with my waddling stomach, pasty thighs, and perpetual ponytail, it’s such a vast improvement over the fuzzy perm, oversized plastic glasses, and plaid jumper from freshman year, I might as well be a pop star on holiday. I just wanted to let yous all know where I’m goin’ fer the next few days. My mom doesn’t have da Innernet (well, dial-up on a 12-year-old computer, so really, we‘re talkin' glorified doorstop) and I’ll be off da grid until Friday. However, I’m bringing a lap top and promise to jot down all our goings-on for future publication. Ciao! Arrivederci! Bon Voyage! Bob’s Your Uncle! See yous later! Ain’t yo! You say "git er done tattoos" like it's a bad thing. 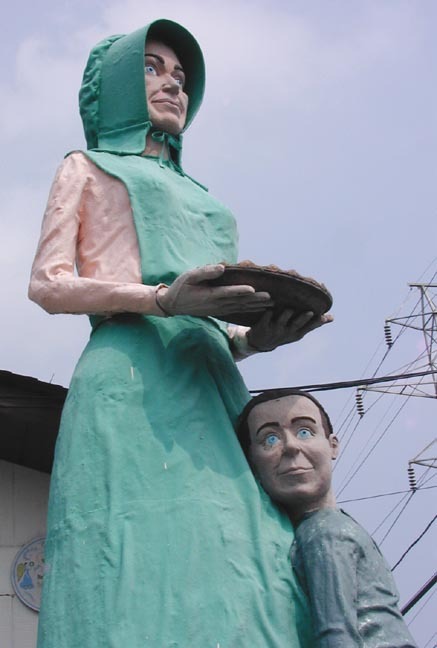 I think I am too frightened by the Pie Lady & Man Child to formulate a coherent comment. 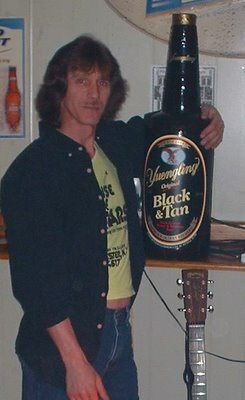 MMMMmmmm Yuengling. Dude. Why go there when you are preggers? That is soooo cruel. The beer of choice for all PA-folks and rightfully so. I dated a guy in Bloomsburg for years. Weeeeeee... have fun lady. Have fun. My very "wordly" Aunt who lived in England for a whole two years still calls it "holiday" too. Enjoy. On my next holiday, I'm heading out your way and booking us for chocolate bubblebaths at the Hershey spa. for some reason sipping ginger ale from jelly jars sounds like heaven. I recomend pick-a-pack in Mahanoy City. Youz guys can get quarts for $1.75 a piece but be warry of the server lady, she may nod off while givin youz yer change. Got the coldest beer ever. colder than the catawissa creek, colder than sleddin on Chinkeys hill, Colder than keg parties in January. And the whole pregnant thing and drinin', that don't count in Schuylkill county. If you ain't drinkin yangs, you'll die of thirst. I am looking forward to your return more than I look forward to the haagen daz bar I'll be eating at the end of the day. That's some high praise. May your childrens' feet be like Hobbits' (well, without the hair). His name is Larry. Definitely, Larry. I am just escaping, in advance, the usual hurricanes (the edge of which we got today as it so happens) and the Hitchcockian mosquitos. Oh no! What am I going to do without my Jozet fix?? Well, have a fantastically fun and relaxing time (and thanks a lot for the nightmares I'll now have thanks to Pie Lady and Man-Face Child). We'll all be here when youse get back. Have a fantastic holiday! We'll be eagerly anticipating your return. I leave for my own holiday next Tuesday. Ahhhh, sweet, sweet holidays. Gah!! Everyone's leaving! I feel so...alone. Have a Black & Tan for me..only makes yours a non-alcoholic one. the brewery is a great tour, and its FREE! with FREE BEER! there's nothing else you need to know. FREE! with his belly showing like that, i'm pretty sure his friends call him Pecs. Man, I know you're country. We just hailed from a three-year adventure in Wilkes-Barre. 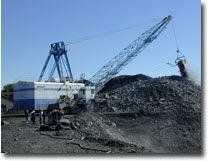 Nothing like coal country to get your holiday done right! I just found you via your MOTW-ness. Congratulations! 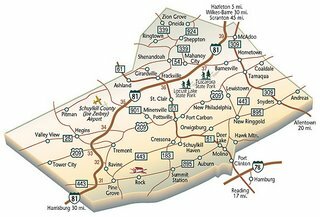 Part of my family is from Pottsville (others are from Mt Carmel and Shamokin) and my grandparents lived in Harrisburg the last 30 or so years of their lives. The slag-mountains sound like a great vacation spot! funny. we were just up the coal strippens in New Boston with Vince (who looks like the guy in the pic)takin our dogs out to train them on birds on Monday. We cooked out and drank a 30 pack of beer all before 11:00 A.M. Then we headed off to the Morea Water dam to go swimming wit our dawgs. I heart Schuylkill County and sweet pizza!! !